The following article was originally posted by the author on The Mad Adventurers Society, and is reprinted here with permission. You can find the original here. When I initially received an email from game designer Keith Baker, I was astounded. 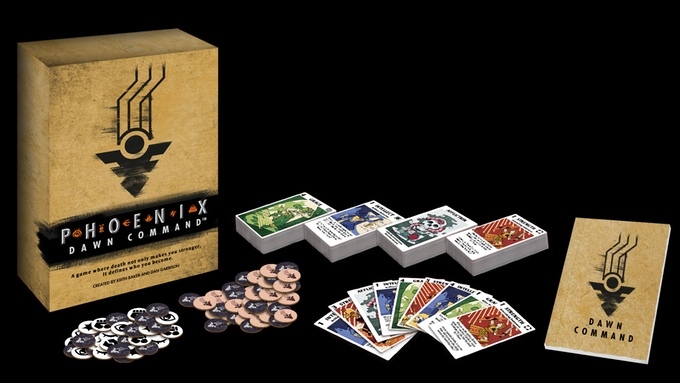 Not only is Baker the creator of the Eberron setting for Dungeons & Dragons, as well as the designer of the narrative card game Gloom, but he had also just launched a Kickstarter for his latest game, Phoenix: Dawn Command. I knew he’d be swamped with promoting his Kickstarter, and I am a nobody blogger who got his attention on Twitter and sent him a 750-word email for his trouble. I was working on a story about a growing trend of what I have dubbed “prop-based” RPGs: games that use proprietary elements, such as special dice, unique tokens, or, in Baker’s case, cards. I wanted to know what was behind this trend; in a matter of months, we’ve seen Kickstarters for games that use proprietary decks of cards, like FAITH, Neon Sanctum, and Phoenix: Dawn Command, and there has to be a reason that designers are focusing on cards. I still haven’t answered that question to my satisfaction, but Keith is such an insightful designer that I’ve spent the past couple weeks reexamining my own beliefs and principles when it comes to game design, specifically around conflict resolution. I’ve previously written about why the rules exist (spoiler: it’s to justify killing the characters when the players don’t want them to die.) Around these parts, MAS’s own dynamic duo, Sammy and Fiddleback, took a run at randomness and PC death on episode 65 the Potelbat podcast back in September (spoiler: everyone hates randomness.) As both a player and gamemaster, I am very much of the crunchy system mastery/optimization persuasion. I have spent hours poring over rulebooks precisely to understand and mitigate the randomness of die rolls in order to assure my character is reliably good at whatever it is he’s supposed to be good at, his “One Cool Thing,” if you will. I’ve played dozens of different systems using a variety of mechanics: d20s, percentiles, dice pools, FUDGE dice, and whatever you want to call Fantasy Flight’s Star Wars dice. I’ve dismissed some for being to high variance—“swingy” like 40k RPGs—and some for being too low—“curved” like FATE and Dungeon World. Maybe what I’ve been looking for all along isn’t the right mathematical outcome curve of dice blended with the right measure of static modifiers and properly turned target numbers. Maybe what I really want is a slight preview of the next die roll. Maybe what I want is actually cards.